"Blood will pour like rain from the heavens!" The effect was instant and absolute. As if seeing a spectre of death, the entire chamber of shouting, threat-filled voices fell fearfully silent. Markuss burned with anger, hot and out of control as thousands of distracted eyes once again anxiously fixed on him. He was losing the battle of emotion versus balance. It hurt too much, and the Prefect of Timar could not contain the contempt that welled inside him. These bickering children whose races he had coddled for thousands of years had not listened to his words of wisdom, never heeded his call for prudence. He could protect them no longer. And now... now they would be sentenced to a grizzly future, one the High Priest could not bare to think about. Suddenly, the passion burst from within him and the energy controller slammed his fist on the glowing podium, sending shards of brilliant light flashing in all directions! The effect was dazzling. It froze the entire audience. "Now heed this!" he commanded, sweeping the room with an accusing finger. "I Markuss, Lord of Timar, Prefect to the High Council, and Keeper to the Gate of Time, hereby condemn you to suffer a future that will be both ghastly and seared with pain. I promise you this... yes, I promise you this. You will lament the folly of your sins. And you will pay for them with a currency of blood!" "Condemned" is the Battlelord's guide to Who's Who in the galaxies. This book is all about the movers and the shakers, those leaders and personalities who will ultimately shape the future of this universe. It's a compendium of aliens and individuals that you the warrior may encounter during your adventures into this dangerous and uncertain future. 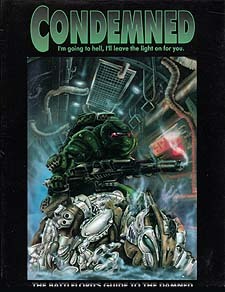 Condemned is a must for the serious warrior who wants to know just who he is up against. Without it... well, you're Condemned!